Norfolk & Norwich University. Other locations now full for 2020. Applications for the February 2018 and February 2019 intakes are now closed. The next available intake will be February 2020, (applications open on UCAS from September 2018). Benefit from varied teaching methods including small groups, scenario based and interactive learning. Enhance your experience and employability with an elective placement opportunity. You'll have the opportunity to join a student-led Midwifery Society. We offer excellent standards of mentorship in the clinical environment. Upon completion, you can register as a midwife with the Nursing and Midwifery Council (NMC), providing opportunities to work within the UK, European Community and further afield. Welcome to BSc (Hons) Midwifery here at University of Suffolk. The team are proud that our programme is a popular choice for those wishing to undertake midwifery studies in the eastern region. The course offers an integrated approach to learning, providing a balance of both theoretical education and practical experience. A cohort size that allows for generous support, from the highly experienced teaching and mentoring teams, is just one feature that has been reported on as most favourable in student surveys. As a team we are proud of employment statistics that identify all students as having gained employment within six months of the course completion. The Department of Health Studies is committed to embedding the NHS Constitution Values into everything we do; they define the behaviours and expectations of all our staff and students, underpinning the work we do in the theoretical and in the practice settings. View the full NHS England Constitution and Values on the Gov.UK website. Further useful information on NHS Constitution Values can be found on the Health Education East of England YouTube Channel. The course runs over 45 weeks per year and each academic year is divided into two semesters. Within each semester students will attend blocks of theory 2-6 weeks and blocks of practice 4-13 weeks. The first year concentrates on essential midwifery skills, anatomy and physiology, communication skills and the nature of professional practice. The focus is on the normal childbearing experience and the knowledge and skills needed to monitor and facilitate this. As the course progresses students will be introduced to more complex aspects of theory and practice associated with childbearing and midwifery practice. The primary intention is to equip the students with the necessary knowledge and skills which underpin normal midwifery practice. The focus of the module will also emphasise the midwife’s role in supporting and facilitating the normal processes of the childbearing continuum and placing the woman at the centre of care. The focus of the module will also emphasise the midwife’s role in supporting and facilitating the normal processes of the childbearing continuum and placing the woman at the centre of care. The aim is to foster independent learning and the facilitation and acquisition of knowledge, skills and attitudes to enable individuals to become part of the midwifery student community. This module will introduce the principles of interprofessional working and contextualising each student’s growing professional identity within the broader interprofessional arena. There will be recognition of the individuality and commonalities within and between professionals, with subsequent analysis of effective interpersonal communication skills at a personal, professional and service user level. The choices made by women about their health during pregnancy have a major impact not only on their health but on the health of their children, family and wider community. Topics will be explored from social, psychological, cultural and biological perspectives and viewed against the government agenda. Normal midwifery practice will be the focus, enabling students to learn with and from their midwifery mentors in these settings. They will observe and participate in practice which will facilitate their learning and enable them to learn from the women and families in midwifery led centres, birthing units, the community and the acute setting. Through critical enquiry, discussion and debate it will enable the student to analyse care. Emphasis will be placed on the ways in which evidence is utilised to enhance knowledge and skills that support and promote normality in practice. The concepts of salutogenesis and holistic care will be explored in the delivery of midwifery care. The overall aim of this module is to extend the students’ knowledge and appreciation of research issues, from an examination and understanding of methodology and means of application, to an understanding of research in the broad context of midwifery care. A range of midwifery topics will be utilised to explore the content of this module. Childbirth for some women can deviate from the path that is defined as normality, yet not become so complex that significant intervention is required. This module will explore the variety of strategies used including listening to and understanding how the views of service users influence care decisions and affect outcomes for mother and baby. As the first point of contact for many women, the midwife has a significant role in the identification of risk. This module focuses on the challenges to midwifery practice, in providing care, advice and support throughout the high-risk childbearing continuum. This module runs concurrently with the module entitled Developing Midwifery. This module will build on knowledge gained from the level 4 IPL module by continuing to promote awareness of the student’s role in the interprofessional team. The student will use critical reflection, analysis of the service user journey and promotion of multi-agency working across health and social care teams to enhance the care that they provide. This module will enable students to develop skills previously learned and deepen their knowledge through reflection and continued practice. They will also begin to observe and participate in higher risk non midwifery practice which may be experienced by women and babies as part of maternity care. This module will provide an opportunity for the student to produce an individual study project developed from an aspect of midwifery practice. It will enable students to utilise the process-based skills developed throughout the course and allow them to apply problem solving and decision making skills in a novel situation. Interprofessional working in practice is an essential component of the role of new and established practitioners. The module promotes multi-agency working across health and social care teams. Interprofessional working is promoted through the exploration of topical issues within health and social care and students will be encouraged to work as flexible practitioners and critical thinkers. The concept of autonomous practice will be examined with regard to the midwife’s role as lead carer for women experiencing normal childbirth. This concept will also be explored with regard to the midwife’s role as coordinator of care for women experiencing a complex childbearing experience. The module has been designed to facilitate both personal and professional development; and will provide opportunities to critically analyse and reflect both in and on practice. It will encourage students to synthesise understanding and begin to evaluate their own contribution to and participation in evidence based practice. This module consolidates the knowledge and skills developed during the BSc Midwifery course which enable the practitioner to have the knowledge and skills to conduct this essential neonatal screening examination. The aim of the examination is to reduce mortality and morbidity through early identification and referral for congenital abnormalities. "Studying midwifery at the University of Suffolk has been both rewarding and challenging. I have experienced an amazing amount of support since commencing my course, both within the university and my placement location. The theory input is very comprehensive and sets the foundations for the practice side of the course. The tutors have setup tutorials when I have requested a need to see them and have also attended the hospital to see me and this has been very helpful. Alongside the course tutors, university has additional support in place for academic assistance, as well as counselling help if there is ever any need. I have been very fortunate to have worked with an array of wonderful midwife mentors. The experience I have had with my mentors has been confidence inducing, extremely educational and incredibly responsive to my learning needs." Mel, third year Midwifery student. Please note that A-Level General Studies will not be accepted. Applicants whose first language is not English, but who have been living in the UK for 2 years or more will be expected to hold GCSE English at Grade C or above, (grade 4-9 for the new GCSE) or the relevant Level 2 equivalent (if applicable). As part of the selection process, you will be expected to demonstrate good knowledge and a clear understanding of the scope of work that a midwife is required to undertake as well as the significance of the NHS Constitution and its core values. IELTS 7.0 is required where English is not the students' first language. While studying with us, you will have access to excellent facilities and technology. 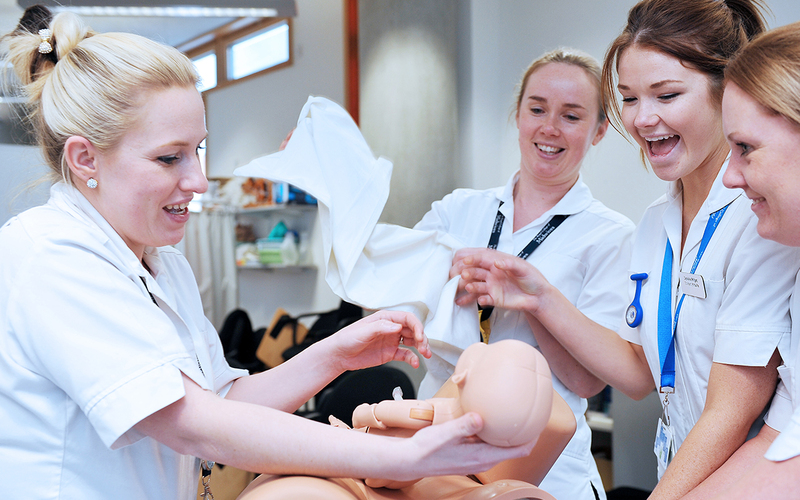 Our BSc (Hons) Midwifery course is based in our James Hehir Building, with access to Clinical Skills labs which utilises simulation equipment such as SIM BABY and SIM Junior. These high fidelity mannequins produce altered physiology, including heart and lung rhythms – ideal for your practice preparation. As well as this, you will also have use of our Waterfront Building, situated a short walk along the marina. The building has six floors, one auditorium which seats 200 people, two main lecture theatres each seating 140 people and 34 teaching rooms seating between 18 and 80 people. These include state-of-the-art AV equipment to enhance students learning experience with us. There are also plenty of flexible study spaces in the Waterfront Building, with approximately 50 iMacs for students to access.